Husband and wife, Will (Jamie Bamber: Battlestar Galactica) and Dawn (Stefanie von Pfetten: The Man in the High Castle), are in financial crisis after learning the job Will was counting on to salvage their financial future has disappeared in the midst of a market collapse. 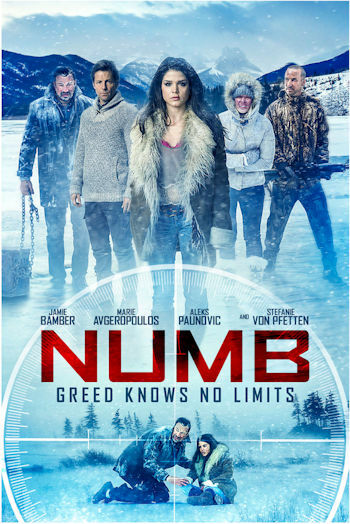 They set out to drive home on the winter highway back to their city, and in a moment of altruism, pick up siblings Lee (Aleks Paunovic: Van Helsing) and Cheryl (Marie Avgeropoulos: The Inbetweeners, The 100), a pair of hitchhikers on their way to start a new life. In the midst of the night they nearly collide with an old man wandering on the snowy highway, hypothermic and horrifically frostbitten. While searching for his ID they discover a wad of cash, a hand drawn map with GPS coordinates, and a single gold coin inside his coat. Will and Dawn reluctantly go along with Lee's plan to report him to the police as a John Doe and pocket the money. 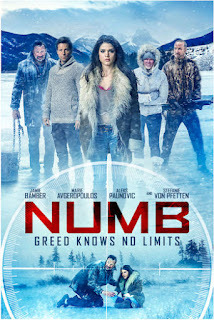 "Numb" will available to watch on Digital Download in the UK from 13th November.